Sheila Rosenblum of Lady Sheila Stable shared great news that La Verdad had a healthy delivery. Just six days ago, she foaled a Curlin filly at Gainsborough Farm. They are healthy and outside enjoying the paddock and sunshine! La Verdad and Curlin filly at Gainsborough Farm from National Museum of Racing on Vimeo. Sheila Rosenblum sent a video of her beautiful mare from Season 1, La Verdad. She is in foal to Curlin due March 14. LaVerdad_FoalPatrol from National Museum of Racing on Vimeo. 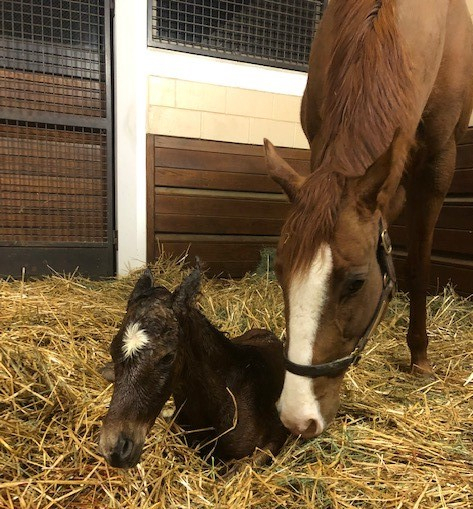 Sheila Rosenblum of Lady Sheila Stable sent a wonderful update that Hot City Girl, La Verdad’s sister, had her first foal....a Bernardini Colt on Sunday, February 10th at Darley: Gainsborough Farm. She had a healthy delivery and Hot City Girl is taking well to being a mom. Congratulations to all!